The Silverwolf Log Chalet Resort consists of ten designer log cabins for two, with maid service, fine log furnishings with queen-sized bed (one with two over-sized singles), handmade quilts, gas log fireplaces, full baths, thick towels, mini-refrigerator, microwave & coffee maker hidden in the hutch. Each chalet has a covered porch with Adirondack chairs. Fresh baked goods, cereal & milk, juice, fruit and Colombian coffee each morning in the privacy of your own log chalet. 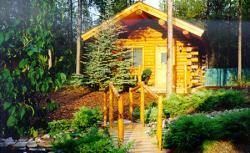 We are located in a beautiful landscaped setting, just 7 minutes from the west entrance to Glacier National Park. Our season runs from mid-may to mid-October. We are a 100% non-smoking resort with first class accommodations. Sorry, no children, and we do not allow pets. Directions: Silverwolf Chalets are located just 6 minutes from Glacier National Park.